St. Petersburg is quite a young and wonderful city. Despite the fact that he is just over 300 years old, his story has many interesting facts, and even more exotic, unique and mystical than some ancient cities. They have a single-valued past, which can not be said about the city on the Neva, built by Peter I at the beginning of the XVIII century. Today the North capital is want to visit tourists from all over the world along with the official capital of Russia. Although the beautiful Moscow is older than the glorious Petersburg. There is magic in this city, it is endowed with a huge attractive force. We'll talk about this later, let's talk about interesting facts that make excursions around St. Petersburg very attractive. Architecture has reached our days. The first thing that catches your eye when you come to St. Petersburg, is its unusual and majestic architecture. And, many of the buildings erected here before 1917, almost completely preserved its original appearance. And this despite the fact that the city withstood 2 revolutions, survived the most terrible time of blockade and bombing in the Great Patriotic War. Here, he is the first interesting fact about St. Petersburg, about the city, uniquely protected by all Saints. From the Neva to the Obvodny Canal, as well as from the Alexander Nevsky Lavra to the port, the Northern Capital looks almost the same as before the October Revolution. At the same time, the city organically combines new buildings, in harmony with different architectural styles. This shows that every decision regarding construction in the city was taken and accepted by the authorities with a very deliberate calculation and almost with an artistic vision. Of the popular places in the suburbs of St. Petersburg, recommended for compulsory attendance, Oranienbaum broke all records for its pristine preservation. Its architecture has retained its historical authenticity to the present day. Oranienbaum palace and park ensemble is the only one that has not been destroyed during the entire time since its inception, even in the harsh years of the Great Patriotic War. His magnificence and greatness came to us in its original form, which is worth seeing. The most surprising fact is that 10% of the entire urban area is covered with water, the historical center of the Northern capital is still based on deciduous piles that are not prone to rot. Therefore, the city will never dive into the swampy terrain on which it was erected. The mystery in the ball of the Admiralty spire. Admiralty with a symbolic spire is a monument of Russian classicism. Its central part is adorned with a monumental tower with a spire, crowned with a gilt ship - one of the symbols of St. Petersburg, Its weight is sixty-five kilograms, its gilding took two kilograms of gold. During the war, in order to save an ancient relic for future generations, the Leningraders sewed a cover. But, what is worth mentioning, is the fact that visitors are interested. On the spire of the Admiralty there is a gilded ship weighing 65 kg. Under it you can see the crown, and below it a ball. The ship crowning the spire serves as a symbol of the transformation of Russia into a great sea power. The crown means the Russian Empire itself. The ball in the base of the spire stands as a sphere-world. The question about the content of the ball excites the minds of both Petersburgers and visitors. We have the myth that inside the ball on the spire the egg-box is kept, in which samples of all the gold coins made since the foundation of St. Petersburg were kept. The ball is really hollow. But this myth is debunked by the bare and strict facts. During the regular repair of the Admiralty spire on February 13, 1928, a ball was opened. It contained the newspapers of 1886. They added a few fresh issues of Leningrad newspapers for February 1928. In 1977, 9 more fresh newspapers were placed in the balloon, as well as the text of the new Constitution of the USSR. In addition, the ball has long been a box, which contains information about all the masters who repair the spire since its installation. Different temperatures in the districts of the city. Few people even know from among the residents of St. Petersburg that the temperature, from the center of the city to its environs, differs considerably among themselves. For example, the main and beautiful highway of St. Petersburg - Nevsky Prospect is the warmest part of the city. On Vasilievsky Island, in the Petrogradsky district in the spring it is colder. Local people know that the farther from Vasilevsky Island, the warmer it is. In the autumn, when the air mass from the Gulf of Finland is coming to Petersburg, it is warm even on Vasilievsky Island. 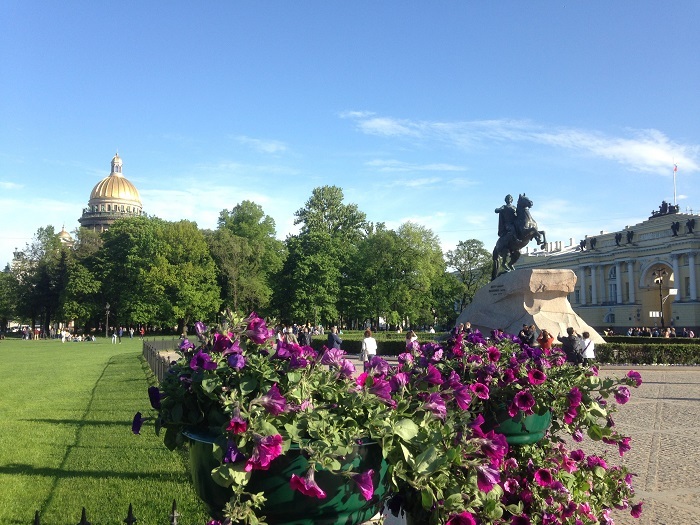 The weather in different parts of St. Petersburg depends on the so-called averaging factors. Also, the temperature difference in the city largely depends on the season. When all the sky is clouded, when the wind blows a moderate, the temperature is the same in all areas. Ironically, with a clear sky in winter, frost increases, the wind weakens, in this case the weather differs from area to area by 4-6, sometimes by 8-12 degrees. In winter, the center is much warmer than in Civic and Rzhevka, in Kupchino, where it is usually colder. In summer, the temperature differs from the temperature in the suburbs of St. Petersburg by 3 degrees. Everywhere is warm, but suddenly you can get under a rain and get soaked to the thread, wherever in the city, while in the neighboring area it can be absolutely sunny and not fall from the sky for a whole day. Therefore, the umbrella should be taken in the morning, going to the sightseeing, even if the sun shines brightly.